One of the most overlooked, yet essential, parts of proper animal care is grooming. Whether you own a cat or a dog, regular grooming can help your pet in many ways. Not only will it keep your pet clean and healthy, but it also helps you to establish a caregiving bond with your pet. It goes hand in hand with regular vet care for cats and dogs. At-home grooming can help avoid costly advanced dentistry in Dartmouth and can even prevent your pet from being affected by common pests. Visit with your local veterinarian in South Coast for even more at-home care and seasonal pet tips that you can use to provide your cat or dog with a long and healthy life. If you are new to pet grooming, there are a few things that you will need to get. You cannot use human shampoo and conditioner on your pet. Make sure to get the proper supplies from your local pet store or purchase specialty items online, as needed. Some shampoos are designed specifically for the age and type of pet. Similar to human babies, a more mild soap can be used for kittens and puppies than for older cats and dogs. Cleaning tools, such as a scrub glove, cotton balls, ear cleaner, brush, nail clippers, ointments, conditioners, hair dryers, toothbrushes, and fur clippers, are just some of the things that you will need to have at the ready when doing at-home grooming. Whether your pet is very young or just new to the idea of at-home grooming, it pays to start off slowly and get them used to handling. Start by just touching your pet’s legs, paws, stomach, neck, and other areas that will be washed during at-home grooming. If your pet appears to be in pain or if anything seems wrong, bring them in for vet care for cats and dogs. Be kind and gentle, but stay firm to show confidence. Many times our pets can feel our concerns about something and will react in return. You should do some form of grooming on a daily basis, either brushing, washing, toothbrushing or clipping, to keep your pet used to this type of attention and care. Seasonal pet tips can be utilized for grooming in winter or summer. If you don’t think that at-home grooming is for you, consider bringing your pet to a trusted groomer. You can ask your veterinarian in South Coast for recommendations. If you need advanced dentistry in Dartmouth, including regular dental check-ups and care, Anchor Animal Hospital provides these services as well in addition to veterinary check-ups, emergency services, and other vet treatments. 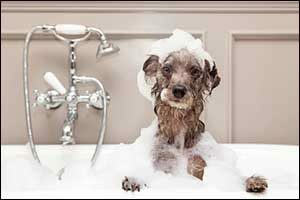 There is no shame in hiring a professional or consulting with a professional to improve your pet’s grooming and health. Whether you do it yourself or hire someone to take care of it for you, there are some basic grooming services that you should provide to your pet. Brushing, bathing, nail clipping, teeth, and ears are the most important. Brushing is something that anyone can do. It should happen on a daily basis. Even if you aren’t comfortable with bathing or clipping, you can do brushing while sitting on the couch watching television or some other leisurely activity. Learning the advantages of each grooming services can be helpful in appreciating the value of performing them in addition to vet care for cats and dogs. BRUSHING – Performed before washing, brushing feels good and helps to remove dead hair and tangles to distribute natural skin oils for healthier skin and coat. BATHING – Warm baths with appropriate shampoos and conditioners can remove dirt, dust, debris, allergens, loose fur, and odors. NAILS – A proper manicure will prevent torn, ripped, broken and damaged nails, which can lead to pain, infection, and other problems over time. NOTE: Avoid cutting into the quick, but keep styptic powder on hand and put pressure on the nail for at least 30-seconds if you accidentally do. DENTAL – Massage gums and brush teeth for fresh breath and healthy mouths. Bring your pet in to see the veterinarian in South Coast if you notice any tooth decay or inflammation of gums. Advanced dentistry in Dartmouth is available at Anchor Animal Hospital. EARS – Special ear cleaning wipes and cleansers are available to keep sensitive ears clean and free of problems. If you notice any issues, make an appointment for specific vet care for cats and dogs. Seasonal pet tips often include checking ears for ear mites and other parasites. For year-round veterinary care and services, bring your pet in for a check-up at Anchor Animal Hospital. Our team of highly trained and experienced veterinarians and veterinary professionals can help provide your family pet with the very best in healthy services. Give us a call at 508-996-3731 to speak with one of our friendly technicians or to schedule an appointment.